There is something about food, and how it can unite us together. It may be over sharing the delights of the same taste, or it maybe getting together over food with family and friends. Sharing food online can brings us together too. A few months back in April, this recipe was shared in an online community, called YOU-app. The lovely Joyce, from Queensland, shared this recipe, and our online friends started making these biscuits. The biscuits didn’t last long in any household and repeat batches were made. 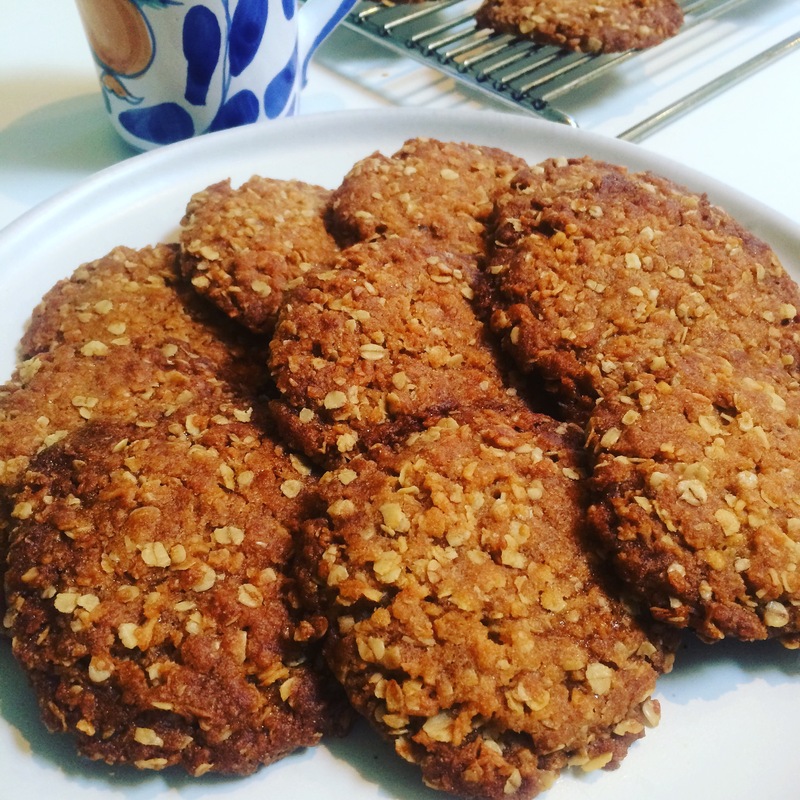 ANZAC biscuits are now being made all over the world, thanks to Joyce. I made them too, of course, and our lovely visitor from France, Pam, loved them too. My friends from Colombia also want this recipe, so this is for them. Anzac biscuits are traditionally made around Anzac day, 25th April. On this day, we remember the Australian and New Zealand men, who fought for our country and the British Empire. The Australian and New Zealand Army Corp (ANZACS) arrived on the Gallilopi Peninsular, Turkey on 25th April 1915. The military campaign ended in defeat, but it is said that this campaign united the Kiwis and Australians army men. Any time of year is a good time to make these, and they will always be greatly appreciated. There is some debate over whether you want a crisp ANZAC biscuit or a chewy one. The longer you cook them the crisper they will be. Good luck, and I hope each time you make these, you will remember our ANZACS who so proudly fought for us. Mix soda with boiling water and add to melted butter, and stir to combine. Add butter mixture to dry ingredients, and mix well. Press down on mixture lightly.